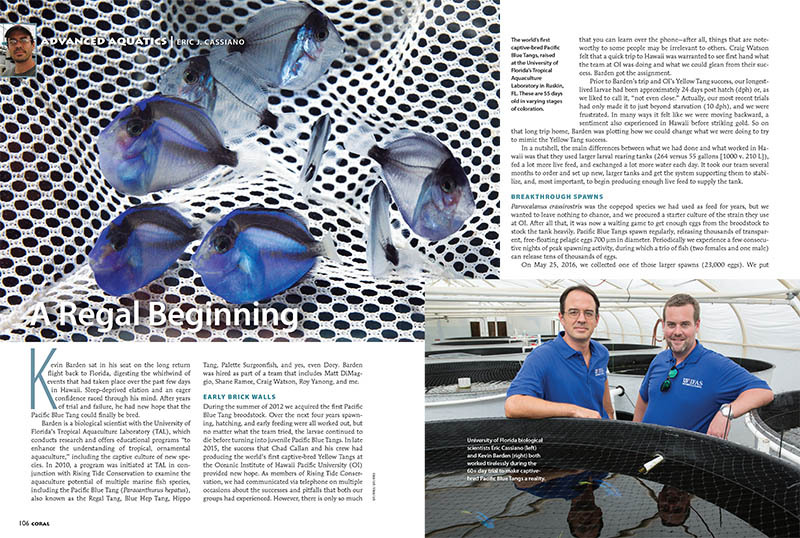 University of Florida’s Tropical Aquaculture Laboratory, responsible for the the first successful captive breeding of the Pacific Blue Tang, Paracanthurus hepatus (as reported in “A Regal Beginning,” CORAL Sept/Oct. 2016), is facing hundreds of thousands in funding losses in this year’s Florida budget. 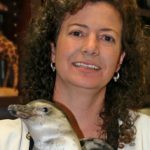 Dr. Judy St. Leger, SeaWorld executive and head of the Rising Tide Initiative. University of Florida’s Tropical Aquaculture Laboratory (TAL) is facing a massive budgetary veto at the hands of Florida Governor Rick Scott in his 2017-2018 budget. According to one report, this veto represents a loss of $778,987 in funding for the year. The budget was reportedly signed into law on June 2nd, 2017, and TAL’s cut is listed in the final veto list. 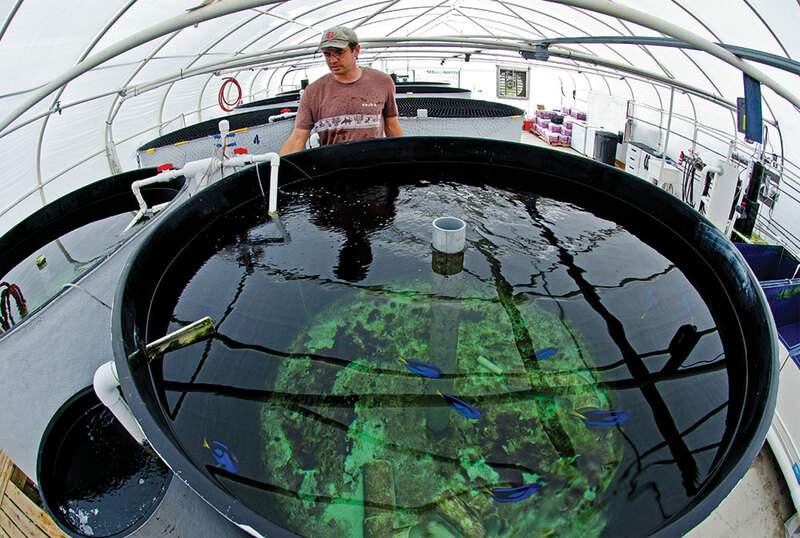 The Tropical Aquaculture Lab is home to longstanding programs that benefit Florida’s sizable freshwater tropical fish farming industry and ground-breaking research efforts in conjunction with Rising Tide Conservation that have pioneered several worldwide firsts in the world of marine fish breeding. The 2016 worldwide aquaculture first, the successful breeding of the Pacific Blue Tang, Paracanthurus hepatus, was achieved by staff at TAL. Biologist Eric Cassiano inspects an 800-gallon (3,028-L) Blue Tang (P. hepatus) broodstock tank at the University of Florida’s Tropical Aquaculture Laboratory. Broodstock tanks are supplied with a circular flow of water that brings pelagic eggs toward the collection bar (left foreground) and egg-collecting tank (lower left). Craig Watson, director of the Tropical Aquaculture Lab at the University of Florida, Ruskin. Reached by CORAL Magazine, TAL Director Craig Watson said: “As of today, no one has been let go. My message is: we are still here and plan on staying. “The University is doing everything they can to keep our program alive. Without such support, the veto represents the elimination of 20 years of development, all of which has been done based on a positive return on investment. Larry, I’ve passed your request along. we organise 10th Euro-Global Summit on Aquaculture and Fisheries which is to be held on oct 08-09,2018 at London, UK, we do have slots available for workshop and exhibition, We would like to know your interest of participation and presentation at our conference . Kindly let us know your interest of participation so that we can let you know thefurther procedures. Larry, I've passed your request along.